Williams, CA, where the ardor for Jefferson state has cooled. 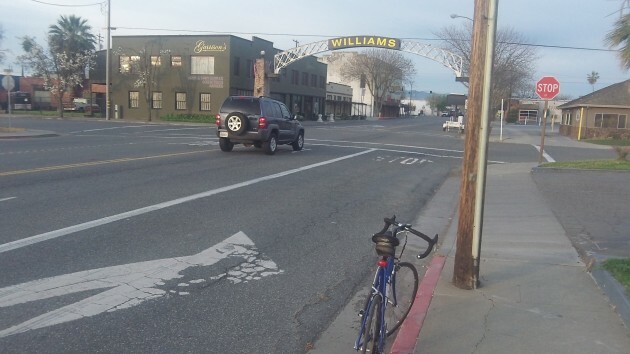 One Sunday morning in March I took a short bike ride around the little town of Williams in Northern California’s Colusa County, and I became aware of a proposal before the city council calling for the formation of a new state, the state of Jefferson. What happened there since illustrates why nothing will happen to make that pipe dream real. When I last wrote about this, the Jefferson declaration — asking the Assembly to support splitting several northern counties from California and having them form their own state — was on the Williams City Council’s next agenda. As it turned out when the day came, council members weren’t too sure about the idea and put off action pending a public town hall meeting a few days later. The matter came up again in April, and the council still wasn’t sure and tabled the Jefferson idea. Members doubted whether many people in town actually wanted to leave California and form their own state. Evidently there was no groundswell of public opinion. One council member was worried about state funding and whether state grants would still be available, according to a report in the online Williams Pioneer Review. The story didn’t say, but it’s a safe bet that Sacramento would make no state grants to any new state of Jefferson. The boards of supervisors in eight northern California counties have voted for a split and a new state, and so have the councils of several towns. But what they really want is for the legislature in Sacramento to pay more attention to their needs, which differ from those of the urban axis that controls the Assembly and all state politics. For example, rural areas don’t want the state public utility commission to order higher electric rates to pay for electric vehicle charging stations to meet California’s green-energy requirements, which do the outlying areas no good. Weaning can be a hard transition for a child…ahhh…local government. it’s not really about grants, and it’s not about electric charging stations either. It’s about change and the uncertainty that change brings, especially when things are running pretty well. It’s also about the grass always being greener over the fence. At least it looks that way until you climb over the fence and it suddenly looks the same. Whatever problems these communities face are not going to disappear just because there is a new state capitol in charge. Roads need to be built, sewers replaced, and electric charging stations may need to be installed to service those tourists that the chambers of commerce are still going to want to come. What those communities stand to lose is the wealth transfer from urban areas to pay the costs of maintaining those state and interstate highways, policing, wildfire control, and other costs of infrastructure that are paid by state governments. There’s no such thing as a free lunch. If you want to keep what you have, you still will have to pay for it. Some of those counties can’t cover their own sheriff costs now. They still won’t cover them if a new state is formed. Pipe dreams are fun, though. It’s simply about restoring representation. This is America, and our vote is supposed to count for something. Today our vote is irrelevant. As far as the grass being greener, I would disagree with that point, it’s more a matter that the pain of here, now, and the current direction is far more scary than the unknown. This has spurred many a sleeping American to action and more join the movement every single day.